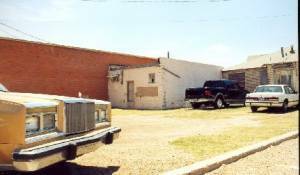 The very small Venture studio was just down the street from Lubbock High School . A whole bunch of classic rock and roll tracks recorded by Buddy is linked with this studio. It is very likely that those songs were recorded at Buddy's home at 19 th street in November and December 1956 with just Jerry Allison on drums. The recordings were probably copied at Venture by Bobby Peeples who had access to the studio. Gone, Have You Ever Been Lonely, Brown Eyed Handsome Man, Good Rockin' Tonight, Rip It Up, Blue Monday, Honky Tonk, Blue Suede shoes, Shake Rattle 'n' Roll, Bo Diddley, Ain't Got No Home, Holly Hop. The small building is now pressed between a barbershop and an autorepairshop. It is being used for storage.